MEXICO CITY -- Pope Francis issued a tough-love message to Mexico's political and church elites Saturday, telling them they have a duty to provide their people with security, justice and courageous pastoral care to confront the drug-inspired violence and corruption that are tormenting the country. The raucous welcome Francis received from cheering Mexicans who lined his motorcade route seven-deep contrasted sharply with his pointed criticism of how church and state leaders here have often failed their people, especially the poorest and most marginalized. "Experience teaches us that each time we seek the path of privileges or benefits for a few to the detriment of the good of all, sooner or later the life of society becomes a fertile soil for corruption, drug trade, exclusion of different cultures, violence and also human trafficking, kidnapping and death, bringing suffering and slowing down development," he told government authorities at the presidential palace. In a subsequent hard-hitting speech to his own bishops, Francis challenged church leaders known for their deference to Mexico's wealthy and powerful to courageously denounce the "insidious threat" posed by the drug trade and not hide behind their own privilege and careers. He told them to be true pastors, close to their people, and to develop a coherent pastoral plan to help Mexicans "finally escape the raging waters that drown so many, either victims of the drug trade or those who stand before God with their hands drenched in blood, though with pockets filled with sordid money and their consciences deadened." Francis' entire five-day trip to Mexico is shining an uncomfortable spotlight on the church's shortcomings and the government's failure to solve entrenched social ills that plague many parts of Mexico - poverty, rampant drug-inspired gangland killings, extortion, disappearances of women, crooked cops and failed public services. Over the coming days, Francis will travel to the crime-ridden Mexico City suburb of Ecatepec, preach to Indians in poverty-stricken Chiapas, offer solidarity to victims of drug violence in Morelia and, finally, pay respects to migrants who have died trying to reach the United States with a cross-border Mass in Ciudad Juarez. Francis began his first full day in the country with a winding ride into the capital's historic center to the delight of tens of thousands of Mexicans greeting history's first Latin American pope. Despite an exhausting Friday that involved a historic embrace with the head of the Russian Orthodox Church, Francis obliged their demands and stopped to hand out rosaries to the elderly, sick and disabled who gathered in front of his residence. The mileage that Francis is clocking standing up in his open-air popemobile is a testament to his appreciation of Mexicans' need to see him up close: After a 14-mile (23-kilometer) nighttime ride in from the airport and the 9 miles (14 kilometers) logged Saturday morning, Francis still has about 93 miles (150 kilometers) more to go before his trip ends Wednesday. 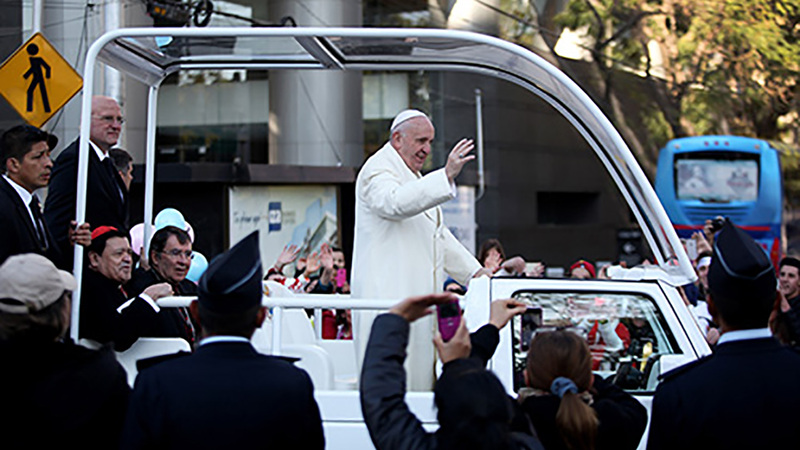 In a nod to his thrifty ways, three of the five popemobiles Francis will use are being recycled from his U.S. trip in September. Francis began Saturday by meeting with President Enrique Pena Nieto at the presidential palace. He told the president and other members of government that public officials responsible for the common good must be honest and upright and not be seduced by privilege or corruption. Corruption permeates many aspects of Mexican society, from traffic cops and restaurant inspectors who routinely shake down citizens for bribes, to politicians and police commanders who are sometimes on the payroll of drug cartels. Even Pena Nieto's administration has been tainted by what critics call fishy real estate dealings by people close to him, including the first lady, with companies that were awarded lucrative state contracts. Francis said political leaders have a "particular duty" to ensure their people have "indispensable" material and spiritual goods: "adequate housing, dignified employment, food, true justice, effective security, a healthy and peaceful environment." In his speech, Pena Nieto said he shared Francis' concerns about hunger, inequality and the dangers of people "letting themselves be carried away by evil." Pena Nieto, who has sought to make economic reform, modernization and bolstering the middle class hallmarks of his administration, is suffering the lowest approval ratings of any Mexican president in a quarter century. Francis then met with his own bishops at the city's cathedral, issuing a 6-page mission statement urging them to be true pastors and not gossiping, career-minded clerics who spew words and inoffensive denunciations that make them sound like "babbling orphans beside a tomb." "I ask you to show singular tenderness in the way you regard indigenous peoples and their fascinating but not infrequently decimated cultures," he said. Later in the afternoon, Francis heads to the Basilica of the Virgin of Guadalupe, the largest and most important Marian shrine in the world. Francis has spoken reverently of his "most intimate desire" to pray before the icon so beloved by Latin Americans, Catholic and not. Francis' visit has been cheered by Mexicans who have been treated to six previous papal trips - five by St. John Paul II and one by Benedict XVI - and are known for their enthusiastic welcomes. Tens of thousands of people lined Francis' motorcade route, some watching from balconies, and thousands more gathered in Mexico's main square, known as the Zocalo, to catch a glimpse as he arrived for his meeting with Pena Nieto. Authorities set up huge TV screens that transmitted the scene inside the National Palace. "We arrived here at 2 a.m. to get a good spot, and we were able to see him up-close. It was very exciting," said Natalia Zuniga, a 26-year-old Costa Rican who traveled to Mexico along with six others. "It has all been worthwhile to see him and feel his presence." On a broad avenue leading to the Zocalo, hundreds of people waited for hours for the pope to arrive. "It's very cold, but it's worth it to see his holiness," said Maria Hernandez, 69. "This will be the third pope I've seen. Hopefully his visit will help us to be better Mexicans." Francis' denunciation of the social ills afflicting Mexico reflected the reality of the largest Spanish-speaking Catholic country: According to government statistics, about 46 percent of Mexicans live in poverty, including 10 percent in extreme poverty. Mexico's homicide rate rose precipitously after then-President Felipe Calderon launched a war on drug cartels shortly after taking office in 2006, with the bloodshed peaking around 2011. Murders declined somewhat for the next three years after that, before ticking up again in 2015. Women have been particularly targeted: At least 1,554 women have disappeared in Mexico state since 2005, according to the National Observatory on Femicide.